The ability to remember all kinds of codes for our credit and debit cards, security alarms, smartphones, other locks and more is kind of slim when you consider how many of them there are. And yes, there are countless numbers of apps that can enable you to store this kind of sensitive data. Store them on the cloud, which as it happens it’s not as secure as one likes to think. At the end of the day they are visible for anyone who will try hard enough to gain access to them. But we stumbled upon one app which gives us an alternative way of keeping our security codes and pins safe. Its name is WordPIN. WordPIN works in a unique method, which does not store your pins on your phone, or the cloud. It’s better to say it helps you memorize and remember them within seconds. 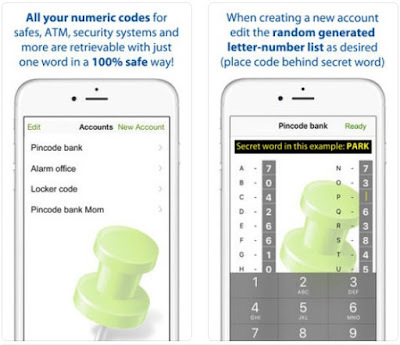 It is a smartphone application which enables you to retrieve forgotten numeric codes such as pins for bankcards, alarm codes, simlock codes and more in a 100% safe and secure way. The app is extremely easy, fast and safe to use. It does not require internet connection so it will work anywhere and at anytime. In order for the WordPIN app to work, you need to choose your secret word. This is important because all your numeric passcodes will be associated with this word. After you settle on one secret word, the app will generate a random list of number-letter combinations. Then all you need to do is adjust the numbers that correspond with the letters of your secret work to match your safe word. And you can do this with the same word for all your pins. And that’s it, you are done. The app doesn’t need to know your secret word in order for it to work. Only you need to always remember the word and all of your passcodes will be accessible to you in an instant. You can also use WordPIN for pins longer than 4 digits and you can change the codes and your secret words whenever you want to. You can find and download the WordPIN app for free at the Google Play Store and the iTunes’s App Store.